Vineyards, Wild West Coast, and Harbour Views. Some good open road riding. Ride out of Auckland on the motorway to the north western edge of the city. From here the riding takes to the country roads passing vineyards offering wine tasting and fine food. The top box has plenty of space for a bottle or two! Take the opportunity to detour out to Muriwai to catch a glimpse of Auckland's wild west coast and also view the large Gannet Colony. Back on to Highway 16 passing through Kaukapapa and then following the beautiful Kaipara Harbour. There are plenty of opportunities to stop, admire the view and try and catch it on your camera before you join up to Highway 1. 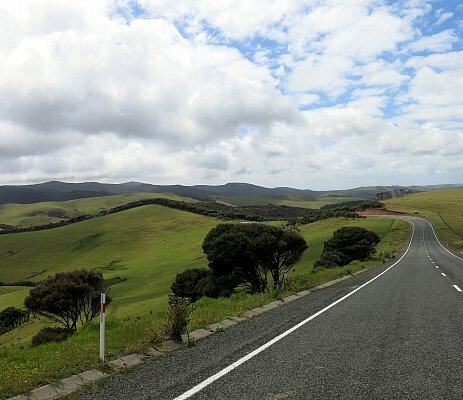 The choice is yours to either back track the way you came or continue the loop back to Maraetai on Highway 1. Riding time: +/- 4 hours return. Open road riding with sweeping bends. Views over the Kaipara Harbour. A chance to see one of Auckland's wild west coast beaches. On highway 16 check out some of the huge sculptures on New Zealand inventor Alan Gibbs' sculpture farm. These are visible form the road but closer viewing is by arrangement only. A variety of vineyards and eateries. A ride over Auckland's harbour bridge.